The Santo Tomas de Villanueva Parochial School spearheaded the celebration of the English Week on November 23,24 and 25, 2011 at the STVPS quadrangle. Premised on the theme: “Outpouring hearts and minds through Language Proficiency ”, the affair commenced with the introduction of the English Coordinator, Mr. Marcelino V. Malabanan . In his speech he emphasized the importance of learning the English language not only for the individual’s local and domestic pursuits but for global affairs as well. He likewise cautioned the audience not to forget altogether their national language but use it together with the foreign language. The activities featured competitions on Readers’ Theater, English Rapping and Speech Choir. 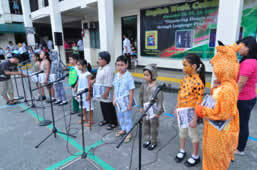 The English Week Celebration was filled with awesome performances by Primary, Intermediate and high school level as they showcased their talents in the Readers’ Theater, English Rapping and Speech Choir Contests last November 25. This is a once in a year competition geared towards developing the pupils’ communication skills as well as enhancing their talents for acting and speaking.